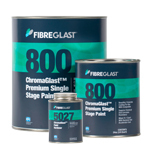 Fibre Glast has partnered with PPG Industries to introduce paint to the composites industry. Our full line of Single Stage paints and undercoatings is designed to provide years of durability, chemical tolerance and corrosion resistance. They are suitable for large or small areas, are ideal for resurfacing worn fiberglass parts, and offer outstanding asthetics. They are available in a wide variety of RAL, glossy and metallic colors. ChromaGlast™ paints and undercoatings are also an excellent option for protecting epoxy parts from UV damage. They can be used on any new composite material, but are particularly beneficial to epoxy parts which yellow and cloud when exposed to direct sunlight. ChromaGlast™ paints and undercoatings bond to epoxy, polyester, and vinyl ester surfaces, as well as metals, mixed materials and even stubborn SMC! ChromaGlast™ offers years of uniform, high gloss durability. All ChromaGlast™ products are First Quality Guaranteed and are suitable for OEM and fleet operations but are also easy to use for outstanding results! ChromaGlast™ Premium Single Stage colors are a high-gloss, urethane-based paint system developed by PPG. Each of our 250+ colors require #5025 Drying Accelerator and #5027 Paint Hardener. 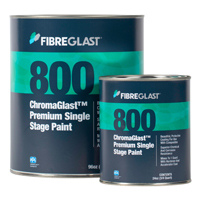 Get all of our 188 RAL colors in ChromaGlast™ Premium Single Stage Paint. This urethane-based paint system developed by PPG is perfect for coating composites, SMC and most metals. Each of our 188 RAL colors require #5025 Drying Accelerator and #5027 Paint Hardener. ChromaGlast™ Undercoats can be used as a sandable Primer, Sealer, or Surfacer to smooth rough finishes and mixed materials. 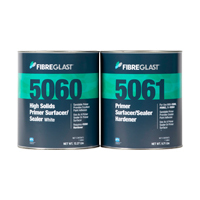 These products feature an epoxy-based formula that is designed to protect composite and metal substrates from corrosion and chemicals, while providing excellent adhesion and consistency for ChromaGlast™ paint. When using polyurethane paint, a hardener and drying accelerator are required to activate the paint and create your protective coating. Additionally, painters often use solvents to thin the paints and undercoats, facilitating an easier spraying process and smoother finished product. For high performance polyurethane and epoxy coatings, high purity solvents are required. ChromaGlast™ Single-Stage Polyurethane Paint is a high gloss coating which does not require a base coat or clear coat. It is designed to protect composite and metal substrates providing an extremely durable, high gloss finish which builds quickly and requires fewer coats to achieve full hiding. 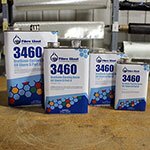 This premium paint is easy to mix, easy to spray and fast drying. It is compatible with polyester, epoxy and vinyl ester resin systems as well as SMC and most metals. It can be used with new work or repairs with a formula trusted by OEM's worldwide. ChromaGlast™ is a low VOC formulation (2.8 VOC max.). It is typically sprayed. 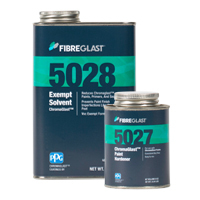 Most users will thin for spraying using the #5028 Exempt Solvent to personal preference (up to 10%). With proper application, a full gloss shine can be achieved that is second to none. Want to learn more about Paint? Fibre Glast has a free Learning Center with helpful white papers, videos, charts, and photo galleries. You can learn more about Paint by reading our free white paper: Paint vs. Gel Coat.